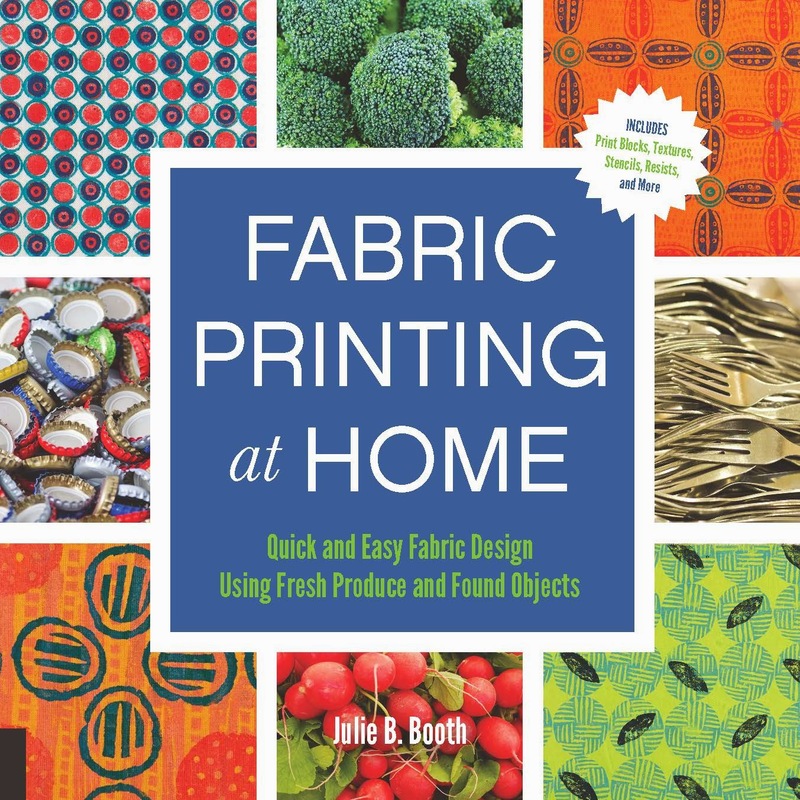 Welcome to Day #6 of the Fabric Printing at Home Blog Tour! We're moving right along here. For those of you just now joining us, Welcome! This has been a fun first week of sharing. If you are just now finding out about the Tour, be sure to look back over the last five days for tips and projects and to journey over to the guest bloggers mentioned in each post. A total of 14 copies of Fabric Printing at Home are being given away to some lucky winners! Just by commenting you are entered in the drawing. In the meantime, I'll continue to give away daily prizes. Just leave a comment at the end of this post and you're entered. Judy Vincentz Gula has been working in fiber since elementary school. Since middle school, she has been a weaver, a spinner, a dyer, and a collector. Later, she studied fashion design at Radford University, earning degrees in fashion design and business marketing. Judy now enjoys merging all that she has learned from her many interests and channeling that into making art quilts and samples for her shop, Artistic Artifacts. Stop by Judy's blog today and leave a comment for a chance to win a copy of Fabric Printing at Home. Friday is recycling day in my house so on Thursday (when I wrote this), I decided to take a look at what materials were available to turn into print blocks, stencils and rubbing plates. Here is my recycling inventory list along with page references from Fabric Printing at Home where you can find all the details to turn trash into surface design treasure! What treasures are hiding in your recycling bin? 1. Corrugated cardboard boxes: Texture Blocks from Kitchen Staples pp. 34-37; Cardboard: The Thick and Thin of It: How to Make Cardboard Print Blocks pp. 78-81; Junk Mail Jackpot p. 84. 2. Thin cardboard including cereal and other food boxes: Cardboard: The Thick and Thin of It pp.78-79; Cardboard Stencils pp. 82-83. 3. Postcards: Cardboard Stencils pp. 82-83; Postcard Pizzazz p. 85. 4. Cardboard tubes: Playing with Plastic Wrap p. 69; On a Roll: Fabric Designs from Cardboard Tubes pp. 88-89. 5. Clothing catalogs: Junk Mail Jackpot: Deconstructing Clothing Catalogs p. 84-87. 6. Envelope with cellophane window: Simple and Sweet: Cellophane Window Stencils p. 87. 7. Newspaper: Junk Mail Jackpot: Deconstructing Clothing Catalogs p. 84-87. 8. Foam meat trays: Making Your Mark: Designing Print Blocks from Recycled Foam pp. 90-91. 9. Netting from a Clementines' box: Create a Collage Design with Layered Textures pp. 30-33. 10. Plastic fruit containers: Found Objects and Kitchen Tools p. 44; Playing with Plastic Wrap p. 69. 11. Egg carton: Found Objects and Kitchen Tools p. 44. 12. Aluminum soda cans: Artful Aluminum: Create Decorative Shapes from Recycled Cans and Pans pp. 92-93. 13. Aluminum cake pan: Artful Aluminum: Create Decorative Shapes from Recycled Cans and Pans pp. 92-93. 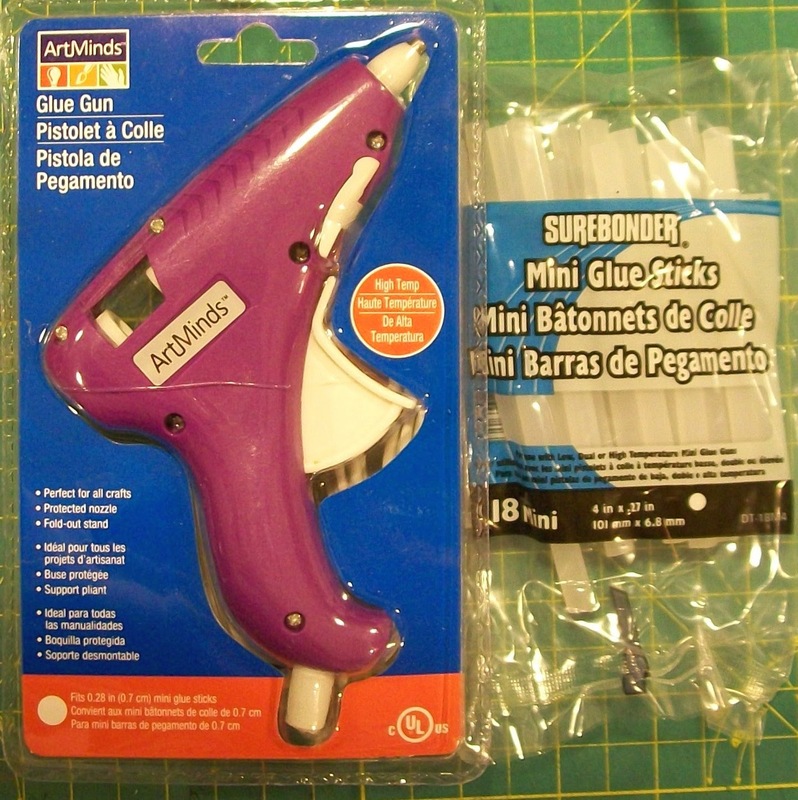 Today's giveaway is a mini hot glue gun and glue sticks. You can use these to make one of my favorite types of print blocks! Leave a comment for a chance to win. I will choose a winner at 11:00 PM Eastern USA time. Check tomorrow's post to see if you are the winner. Your comment also enters you in the final drawing on February 15 for a free copy of Fabric Printing at Home: Quick and Easy Fabric Design Using Fresh Produce and Found Objects. And now for the winner of yesterday's giveaway (Non-stick Fiskars scissors)....congratulations to Kathy Davis! Please email me with your contact information (threadborn@cox.net) so I can send off your prize. Tomorrow, the Tour stops at Susan Purney Mark's blog. Susan is an accomplished quilter and teacher and I'm excited to have one of her works in Chapter 7: Contributing Artists. What a great post! If I wasn't already interested in your book (I was!) this would definitely have roped me in! Thanks! Thanks, Deborah! It's amazing how much "art stuff" is available to us...even what we consider trash! I just took out my recyclables to the can, so I am safe this week, but I definitely will be looking at my trash differently. Just realized that the pumpkin can would make great marks. Such a fun book. 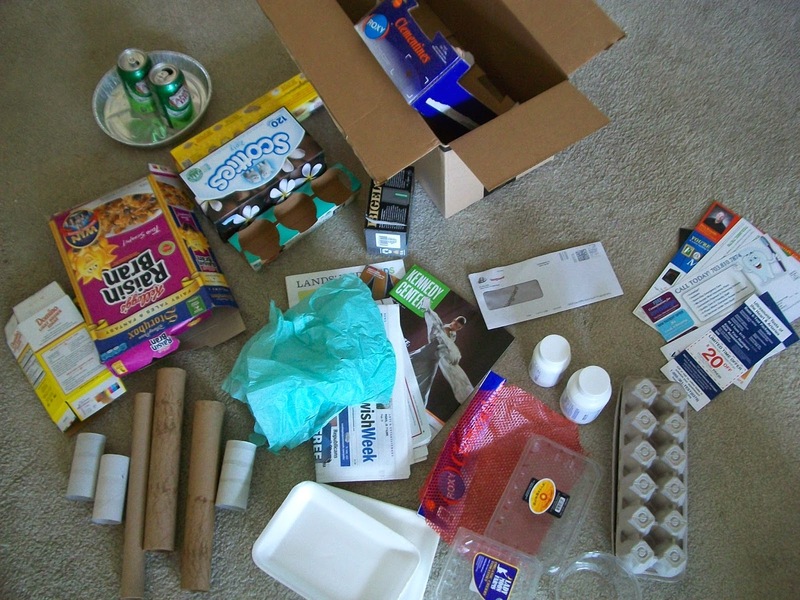 yes, no better way to use recyclables than reuse and especially when the reuse creates so much fun! Hi Laura- I totally agree! Yes...sometimes it's a bit scary what's available...have to pick and choose or the recycling would never leave the house! What fun - I use a lot of these at my local primary school!!! Then you definitely need a copy of the book! I'm hoping that teachers might find it to be a useful teaching tool. Hi Lydia- would love to see the results of you deck party! Each year, I plan summer art projects to do with my extended family. I love doing art with my young nieces and nephew! Jans- I absolutely love "go shopping around the house"! Just perfect! This is not helping my goal of getting rid of stuff! Whoops...sorry to be a bad influence! Love the ideas and want the book! Ever since this blog tour has started I've decided to start collecting bits and pieces so I can try the printing techniques being demonstrated. That's so wonderful, Maya! You are so talented, I can't wait to see what you come up with. I'm loving your "found" poetry series! Love all of the blog tour posts so far! Would love to win the book!